How do I use goals with my course members? Goal tracking is easy in your courses. If you want to set a goal for your course, all you need to do is create a goal and assign it to the course. 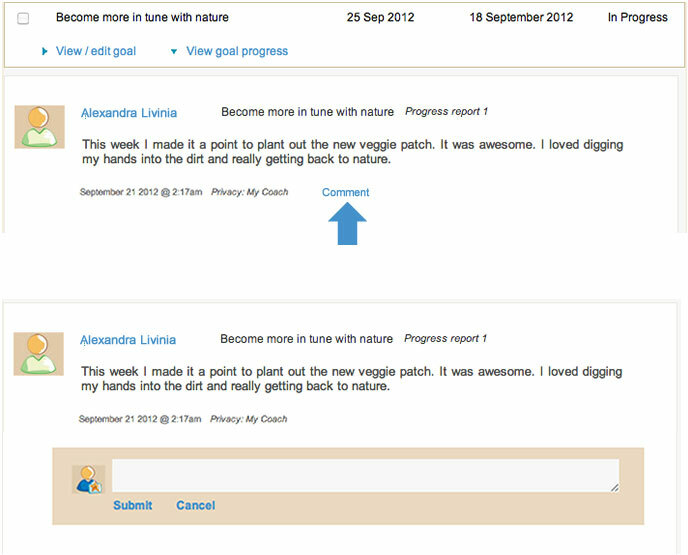 Your course members will be able to post reports about their progress towards their goals (either private or shared). You will be able to comment on any entries. Your course can have as many goals going at one time as you like. You can set milestones, a target date and a reward if you like. Once you have created a course, access Course Management (under Coaching and Courses from the drop-down menu). Here you will see a list of your courses. Clicking on any name will drop down a range of tools, including Course goals. From this window, you can create and assign goals. Click on the button at the top that says "Create a goal." An area will drop down where you can create your new goal for this course. Choose a title and write a description. You can provide a target date if you want, or choose to make this an Ongoing goal. You can also add a reward that you encourage your course members to enjoy when they complete their goal. If the goal is fairly large, you might want to provide milestones along the way with optional target dates for these as well. These should be arranged in chronological order leading up to the goal target date. You can add as many milestones as you like—simply click Add additional milestone. 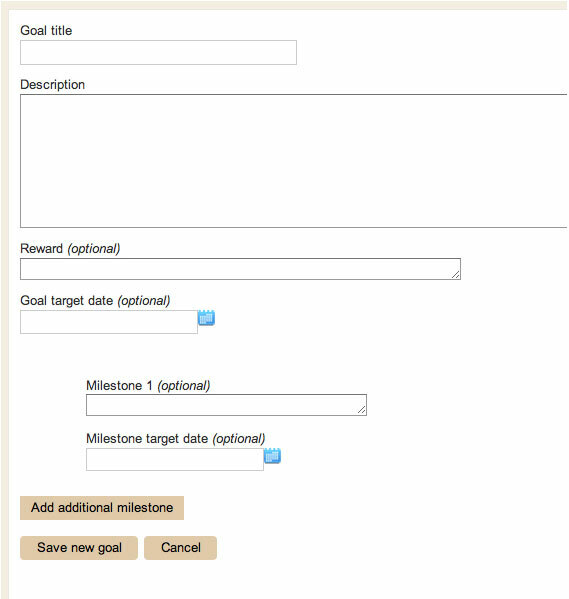 You can edit your goals by clicking the link View/edit goal then selecting Edit. After making your changes, click Save. Goals are specific to your individual course, so they won't show up in any of your other coaching or courses. In the column marked Assign Date, click the link Assign or the calendar icon and select a date. This is the date your course members will be able to see your goal. What do course members see from their dashboard? Your course members will be able to read your goal and create progress reports from the Course Pad in their dashboard. They can choose which privacy setting and whether to alllow comments. If they choose "Only me" as the privacy setting, you will be able to see they wrote and entry but not read it. They might also allow other course members to read and respond to their progress reports, increasing course interactivity and involvement. How do I read and respond to goal progress reports? You can read your course members' progress reports toward their goal from the same page where you created the goal (the Course goals page in Course management). Your course members will update the status and add details of their progress toward their goal from their dashboard. Click "View goal progress" to review the details your course members have provided about their progress, any setbacks they have encountered, and so on. When they have reached their goal, they can mark it as Achieved, which will be noted in their progress report. To comment, just click the Comment link. Clients can comment back, and this way you can have a productive exchange regarding your clients' goals, keeping them motivated and on track.